Set on the shores of the Andaman Sea, Phulay Bay offers unspoilt views of the naturally rugged shoreline and dramatic limestone karsts which make up this beautiful part of southern Thailand. Venture to a captivating corner of the world, where glistening sands and blue skies converge with the Andaman Sea, and where the charm and natural beauty of Thailand blends with an aura of serenity and discovery. 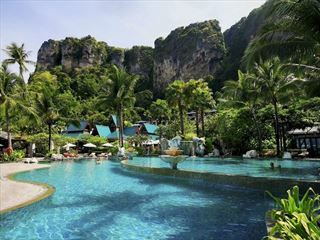 Once there, Phulay Bay, a Ritz-Carlton Reserve, envelops you in an incomparable setting. 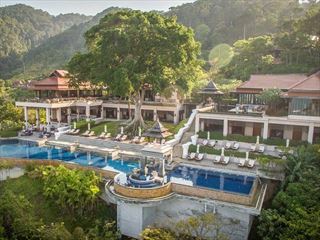 Phulay Bay is a private resort located 40 minutes from Krabi International Airport and two hours from Phuket International Airport. Phulay Bay welcomes you into a peaceful realm of contemporary Thai décor and gracious service in villas offering private tropical garden or ocean views. In total there are 54 one bedroom villas that are uniquely spacious and well-appointed. All accommodations feature distinctive touches such as flat screen televisions, large indoor baths, spacious walk-in wardrobes and delightful verandas appointed with lounge beds. Each villa has enhanced amenities including outdoor baths and private plunge pools. To assure your needs are met, a personal butler is at your disposal 24 hours a day. With a tantalizing selection of casual and formal dining options and experiences as pleasing to the eye as to the palate, Phulay Bay presents a culinary voyage inspired by the flavours of the world. Each restaurant features dishes made from only the finest ingredients, sourced from local markets each morning, then served with flawless Thai hospitality in settings that reflect the unique culture and architecture of Thailand. Jampoon Restaurant, International home style cooking offering a diverse selection of western style cuisine with Asian flair. The Restaurant Action Kitchen features Chef Table dinners and private events. Lae Lay Pavilion, overlooking the Andaman Sea, serves dinner each evening and specializes in grilled seafood that is delivered fresh daily. Sri Trang, will offer traditional Thai cooking in a modern, minimalist setting using the very best of ingredients and cooking in the authentic Thai traditional Cuisine. Chom Tawan – Sunset Lounge, provides casual dining options throughout the day, as well as plush lounge beds ideal for catching sunset over tropical cocktails. Raw, Spa café, provides cuisine based on "raw" philosophy offering nutritional life menus for those who concentrate on health and therapeutic purposes. 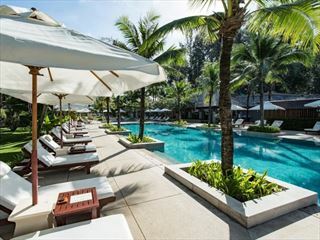 Plai Fah, an infinity pool bar which offer outdoors Restaurant and Bar featuring casual dining both Western and Asian style.